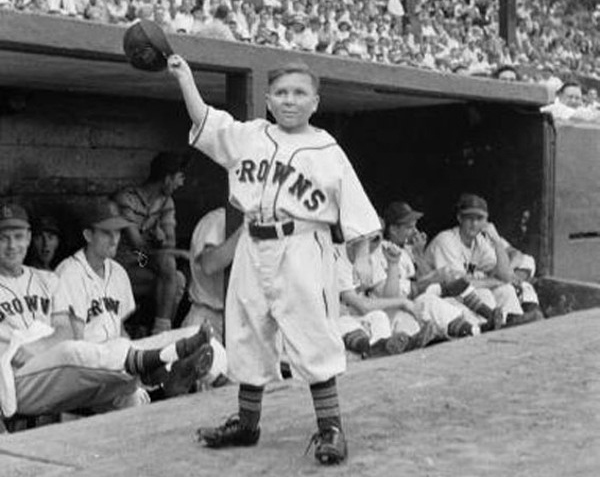 Eddie Gaedel at his only at-bat appearance for the St. Louis Browns, August 19, 1951. His jersey, bearing the uniform number 1/8. While playing with a toy bow and arrow, William Thurber accidentally shot his seven-year-old brother, James, in the left eye. A local doctor bandaged it, but a few days later the eye began to cause pain again and a specialist determined it would have to be removed. Later in life, Thurber’s remaining eye began causing him problems and he underwent five operations in 1940 and 1941. (The operations were a failure, and he would eventually become nearly blind.) During this period he found it difficult to work, but somehow, after the first operation, he managed to finish one of his most famous pieces, which, his wife later recalled, was the result of the “fact that he couldn’t read” and instead listened to baseball. He finished the story too late for the 1940 baseball season, however, so the Saturday Evening Post published it in April 1941. Many of Thurber’s fans have noted the similarity between the barely literate dialect employed by the narrator of “You Could Look It Up” and the vernacular of athletes portrayed in Ring Lardner’s stories. But, as Thurber biographer Harrison Kinney writes, “nothing by Lardner matches Thurber’s wild plot.” The story acquired additional notoriety in 1951, when Bill Veeck became owner of the ill-fated St. Louis Browns, a team that ranks, in his own words, “in the annals of baseball a step or two ahead of Cro-Magnon man.” During that lamentable season, Veeck hired Eddie Gaedel, who at 3 feet 7 inches tall remains the shortest player in the history of major league baseball and whose career lasted for all of a single at-bat in a game against the Detroit Tigers on August 19. Veeck denied that he got the idea from Thurber’s story, although he admitted he suddenly recollected it, with more than a little nervousness, during the game itself. As to what happened to Gaedal, whether he struck out, walked on balls, or even succumbed to the temptation of swinging at a pitch—well, you could look it up. Note: “Damon and Phidia” refers to the legend of Damon and Pythias (symbolizing true friendship); “Pope-Hartford” was a motor vehicle manufactured during the first decade of the twentieth century. It all begun when we dropped down to C’lumbus, Ohio, from Pittsburgh to play a exhibition game on our way out to St. Louis. . . . If you don't see the full story below, click here (PDF) or click here (Google Docs) to read it—free! This is a masterpiece and I will enjoy reading it again! Just got to this story in my LIT class.. Thanks for your post. very insightful .